Lavazza Ground Coffee. A blend that combines Brazilian Arabicas with African and Indonesian Robusta coffees. 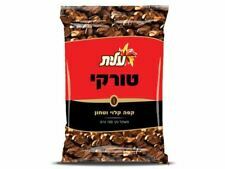 An intense and well-balanced aroma, full bodied and fragrant flavor, rich aftertaste with chocolaty notes. Derive intense pleasure from every break with a cup of Lavazza: Crema e Gusto Ground Coffee. Regardless of whether a finely brewed cup of coffee is fancied for mornings or evenings, this blend of fine coffees offers a distinct, strong flavor in a chocolaty brown color every time. The 20 pack 8.8oz package is ideal for individuals or families and will last a long time while providing an energy boost with every cup. "Lavazza Qualita Rossa - Caffe Ground Espresso, 8.8-Ounce Bag"
First of all, it has the best aroma of any espresso or coffee I've ever smelled. It makes an awesome crema. It takes great, very smooth but a nice bold flavor. Italians know what they are doing when it comes to espresso. I have a air tight container I purchased and this coffee stays really fresh even after two weeks. When you smell the ground coffee, you'll know that you've got something really good. It has an excellent crema. It tastes great with absolutely no bitterness. You'll love it. This is the second time I've found great coffee and great prices with Pharmapacks. These guys really deliver the goods along with very reasonable prices. Can't ask much more. Wonderful Italian coffee with excellent crema. We always make certain that we have some on-hand along with our other great Lavazza roasts.